It’s time for another blog hop! This months theme is Childhood. If you arrived here from Heather’s blog, then you are right on track. If not just keep hopping along until you come full circle. 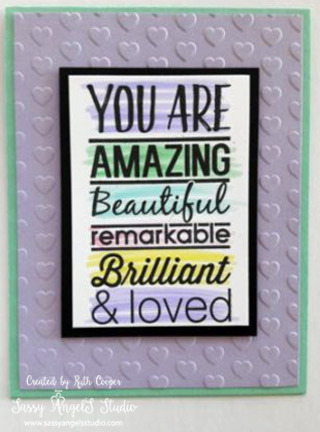 I know several little girls that would love this card! I started by making the colored circle. I took a Color Splash sheet & heavily spritzed it with water on both sides then started dropping Sweet Berry, Lavender Fusion & Pineapple Smoothie Splashes into the water on the Splash sheet. When the color started to blob, I spritzed the sheet more. I set the sheet aside to dry. I don’t work in gold a lot as I much prefer silver, but there is something about the thin gold lines in Laurel Burch art that is very appealing with the rich color. Much like the thin gold accents found in Washi or Yuzen paper, another favorite of mine. I stamped the angel from the Guardian Angel set in clear pigment ink & embossed in Gold embossing powder. I used my Color Splash Pencils & a Journey Blending Brush filled with water to color my angel. I left the wings uncolored, added glue & sprinkled with Sparkle Cuts. I cut my little angel out with the matching die. Next I worked on the Whip Cream card base. 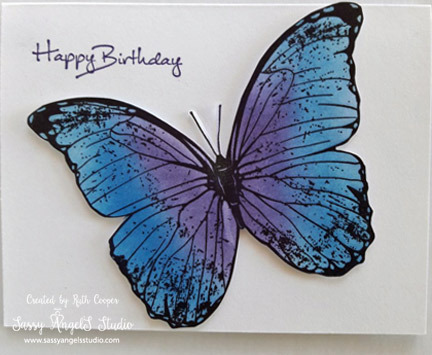 I stamped the sentiment from Be Happy in Lavender Fusion. I took the large stars from Create Confetti, stamped them in clear ink & embossed with White Embossing powder. They are subtle but add great tone on tone interest to the card with a bit of shine. After the Splash sheet was dry, I cut a circle out with Journey Circles & popped it & the angel on the circle with Journey Foam Squares. Next up on the hop is Betsye’s blog. It’s a short but fun hop this month! Please leave some love in the comments of each artist, it’s always appreciated. Aren’t these Color Cross cards beautiful? There are 2 because I colored them differently with the Confectionary Days Panpastels within the silver embossed outlines. The lovely flower card was made with the Amazing Day stamp set from the Bloom This Way mini catalog & colored with the Color Burst pencils. I was trying to incorporate a couple of cards into the set that could easily be used for guys. The pup yesterday & the world card today are what I came up with. Again if you are not a Bloom Box subscriber, you will be waiting a couple of more months before you can order the My World stamp set. 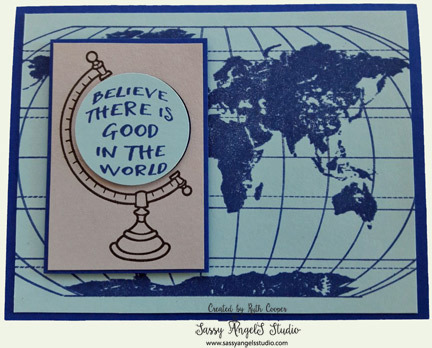 It looks gray but the mat for the globe axis is brushed silver for just a touch of elegance on this card. The Bunny Bum was just pure fun. Unfortunately I had nothing on hand to create a fluffy white tail. The sentiment is from Happy Eggster which is a free Bloom Benefit. With every $50 you order, you can pick a Bloom Benefit for free all year round. We all like bonus & free items! 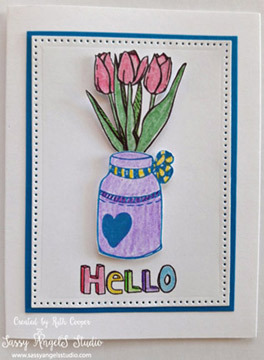 Bloom Benefits include stamps, dies & embellishment pieces, there are several to choose from. I hope you enjoyed this look at February’s Buffet cards. Think about joining in on April 29th for the next Card Buffet. For March 25th, I will be hosting an RG Presents Spring into Summer event instead of a card buffet. There will be more RG Presents events this year. Stay tuned for more info. Do something creative this weekend! I’m running a bit behind my goal to get 2 blog posts in a week but determined to make this week work. Life is still just upside down enough that I also am not getting my samples done as early as I’d like but I’m improving. Most months of 2017 I will be offering a Card Buffet on the last Saturday of the month. It will include 8 cards for $1 each & you can make as many as you like. Now in order to keep it budget friendly these are simple, basic cards with just a touch of WOW. Also at this price point everyone is required to bring their own adhesives. It works really well & leftover card kits are modified either for Cards for the Troops or the Salvation Army to bless others. In this post, I am highlighting the first 4 cards. These cards feature our FSJ ATS stamps, perfect size for quick cards as well as Artist Trading cards and very affordable for starting your stamp collection. I also used our newest embossing folders for a bit of dimension. Fun! You can check out the newest products in the Bloom This Way mini catalog, but you’ll need to hurry as this is the last month before the Spring into Summer catalog launches April 1st. These cards are so yummy! I cased the butterfly idea from a fellow coach because it’s so pretty. If you are not a Bloom Box subscriber you are going to have to wait a couple of months to purchase the butterfly. Bloom Boxes are so much fun & at $24.95 plus shipping a great way to treat yourself to a new stamp set & 4 cards kits, plus learn some new techniques each month. Bloom Boxes are a 6 month minimum commitment. You’ll get to play with brand new stamp sets a full 3 months before they are released for everyone to buy. 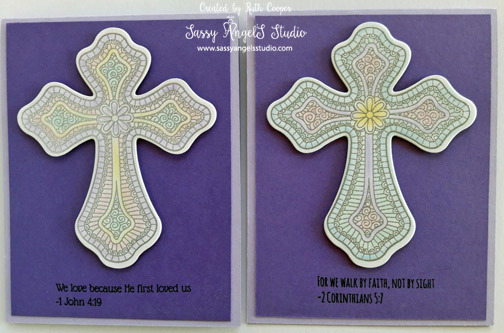 I used Panpastels on both of these cards for the fabulous bold color. On the banner card, I stamped the background in clear pigment ink & then colored with the Panpastels. The butterfly is stamped in Black Licorice & then colored. Thanks for popping by! Stay tuned for Part 2 of the February Card Buffet. There are pluses & minuses to working your own business from home, the most challenging one being time dedicated to the business. So I am going to challenge myself to post twice a week during the month of March & see if I can develop a new habit of posting more regularly. 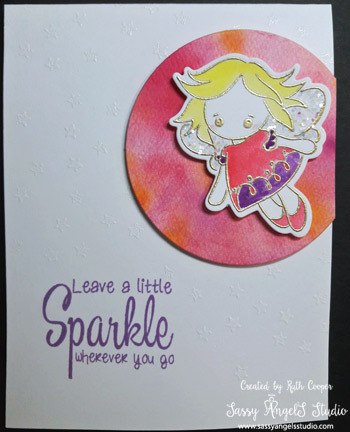 And don’t forget you can find more of my business posts over on my Facebook page www.facebook.com/SassyAngelSStudio/ I will often do quick posts of cards & artwork there as well as Fun Stampers Journey promotions & class reminders. Our youngest son’s birthday is in February & like most of the guys in my family, well…let’s just say they don’t really care if we celebrate their birthday or not, or if they get a handmade card. However, we have a standing tradition of a family birthday dinner. Sometimes at a favorite restaurant & sometimes take out at home, playing board games & visiting. I let Colton off the hook the past year or two with no card, so this year I made sure to create one for him. I originally thought I might use this card for the Dude Blog hop & then decided to make the motorcycle card instead. I used one of the prints from our Mother Nature collection for the background, layered on a Lemongrass card base. I happened to pick up the Pennant Fun dies at Leadership & decided they fit the patterned paper perfectly. I cut out my Whip Cream pennant with the piercing element for detail. 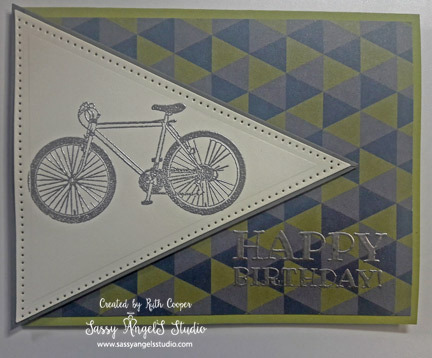 I choose the Bike Life stamp set & embossed the bike with silver embossing powder. I then layered it on a Riverstone mat that I hand trimmed to be a little closer than the next size die cut which was too big for the card. 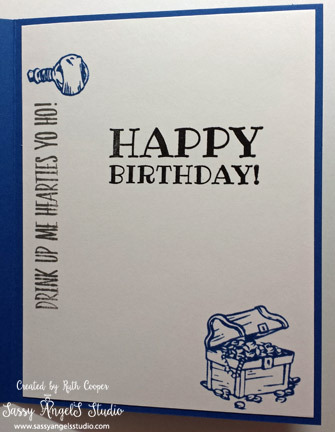 The happy birthday sentiment is from the Rock Notes set & is silver embossed on the patterned paper. I whipped this card up in under 30 minutes, great when you need a card quick. Take some time out of your busy schedule to do something fun this week! Welcome to the Journey Blog Hoppers Hop! If you arrived here from Becky’s blog then you are right on track. No worries if you didn’t just keep hopping until you come full circle. When the weather is warm, we see a lot of motorcycles here in Oklahoma. I made this card to reflect leaving the OKC metro area behind & hitting the open road. This card can easily be used for many different occasions. The card base is Pomegranate Splash with Brushed Silver & Pool Play layers. I used the Journey Long Rectangles to create the horizon line & added a strip of Denim Days embossed with the new Love Stripes Embossing folder to the bottom. I needed a “city” so I used the Build-A Skyscraper stamp set to make my buildings. I used Pool Play ink for the buildings so they were more in the background. Tone on tone offers a softer effect. 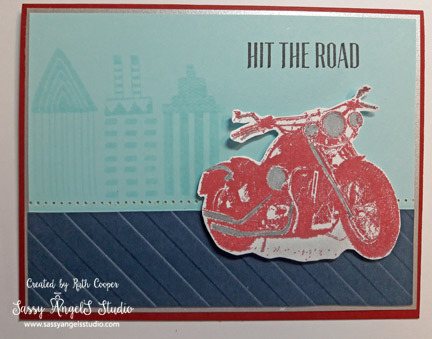 The sentiment is from the Hit The Road stamp set. I then stamped the Let’s Ride motorcycle on Whip Cream in Pomegranate Splash ink & fussy cut around the image. I then pulled out my Silver Silk & highlighted the lights & some of the chrome areas on the cycle. A touch of River Stone PanPastels beneath the bike softened the stark white so it blended with the card more. The motorcycle is popped with Journey Foam Squares. Be sure to check out all the artists on the hop & leave some love in a comment. Your next stop on the hop is Betsye’s blog. I stole a bit of creating time this week to make 2 family birthday cards. I thought it was cool when the Can You Case It Challenge also was for birthday cards. The week turned busy & I’ve just found a few minutes to create a post. The card base is Huckleberry Fusion, with a Pool Play mat background. I used several stamps from the set on a large Journey Acrylic Block to create the background with River Stone Fusion Ink. Using the Journey Circles dies, I cut Journey Brushed Silver cardstock to look like a porthole with the piercing elements. The pirate octopus is stamped on a piece of Journey Color Splash Sheets watercolor paper, actually colored with Journey Splashes at convention & was leftover from one of our class projects. I like to keep handpainted scraps since a lot of work goes into making them unique for future projects. I then fussy cut the octopus & mounted with Journey Foam Squares to the circle. 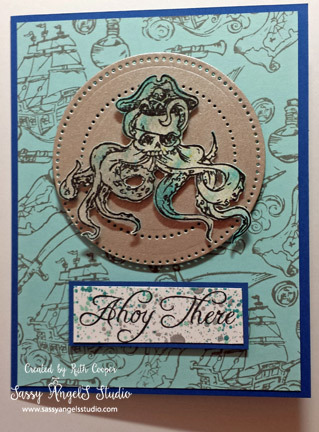 I stamped the Ahoy There sentiment on Whip Cream & splashed with Silver, Turbo Teal & Cool Pool to compliment the colors in the octopus image, trimmed & mounted on a Huckleberry Fusion mat. I used more stamps from the Ahoy There set for the inside with the Happy Birthday sentiment from Rock Notes in Black Licorice & Huckleberry Fusion inks. As a Journey Coach, I use Journey products exclusively for the majority of my projects. However, as a stamp artist of more than 30 years, I do have a few other favorite companies I shop from occasionally. When I saw the unicorn set from Simon Says Stamps, I knew it was perfect for Stephanie’s birthday card. I panicked when I couldn’t remember where it got packed for our move & found it at 1 am in the morning while creating Dustin’s card. I also get the Stamp of Approval collections from Catherine Pooler & used the new die in the newest SOA Lovely Notes collection. 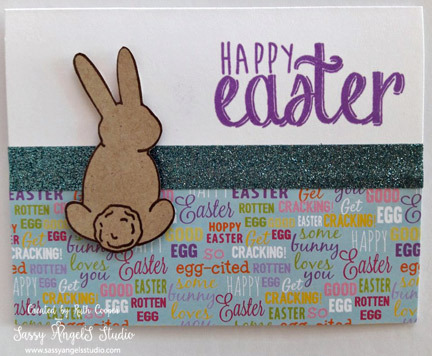 Everything else in the creation of this card is Fun Stampers Journey products. I’m loving the new Be Amazing colors in our FSJ collection. The base is Turbo Teal, matted with Orange Rave embossed with Yummy Dots embossing folder. The die cut is an extra splashed background from my convention swaps, using all the Be Amazing colors of Turbo Teal, Orange Rave, Cosmic Grape, Electric Lime, Outrageous Pink & Sour Lemon. 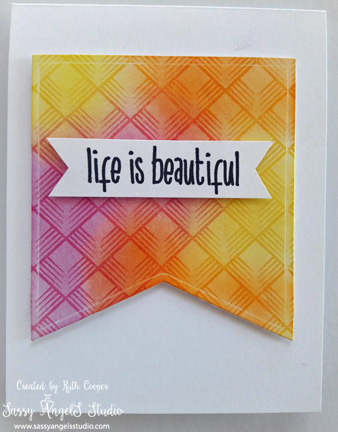 I stamped the sentiment from Greeting Trends SS-0166 in Turbo Teal Fusion Ink onto the die cut piece. I stamped the unicorn in Black Licorice ink & then used the Be Amazing & Silver Silks to hand paint the image. Since it was so detailed, I used an acrylic block for a palette & 1 drop of each color & a tiny paint brush. I cut the star from Electric Lime with the Star-dom dies & piercing elements. 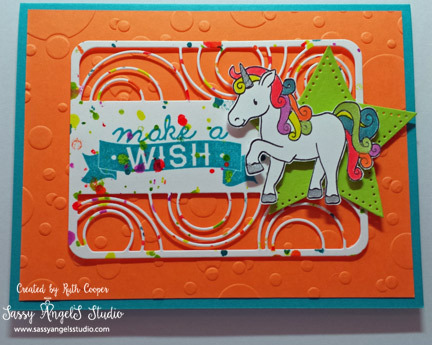 The star is flat on the die cut piece, the unicorn is popped with Journey Foam Squares onto the die cut & the die cut is popped onto the background. By using other products with my Journey products, it shows my customers the possibilities they can achieve with their own products at home. Life is still a bit topsy turvy as we wait to close on our new home in the next few days, but I had the chance to do a wee bit of creating in the past week. Our oldest son & daughter-in-love celebrated their 5th Wedding Anniversary on Saturday, so I had to get a beautiful card done for them. In the midst of final packing, I took out some of my new Fun Stampers Journey convention goodies to create their card. 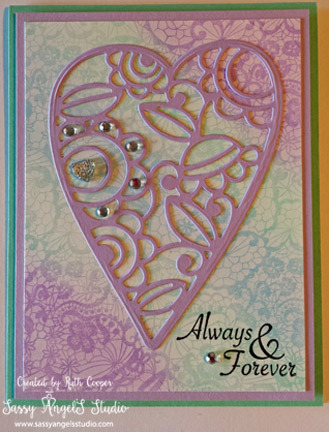 I just love these new Decorative Heart Dies! I paired them with our new Lace Background & Pan Pastels in our Confectionary Days color palette. I stamped the Lace Background in Clear Pigment Ink. Sponged on the pastels in Pretty Amethyst, Cool Pool & Pool Play. The Pan Pastels make it so easy to create a beautiful background. I stamped the sentiment from the retiring Branch Out stamp set in the corner. Out of Pretty Amethyst I die cut out the largest heart in the set & layered on the background. I didn’t want to overwhelm the card with bling so I added just a few Cut Rhinestones to one flower’s petals & added a Heart Sparkle Droplet to the center. I then layered the background on Pretty Amethyst & popped it up onto a Cool Pool card base. Pretty, elegant & quick. My card happened to fit in with the Can You Case It Challenge to use your favorite die. This is my very 1st time participating in the challenge & once we are moved & settled, I look forward to participating more frequently. These hearts have already become my favorite for their versatility. I can’t wait to make many more cards & designs with them. As a matter of fact, I already created another card with them in my training meeting yesterday. 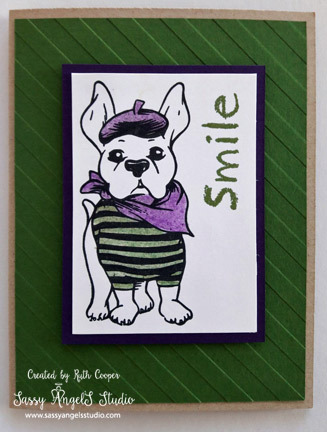 Deb Valder, my upline, is on the design team for Can You Case It & we got to recreate a version of her card. Stay tuned for updates as I get the new studio set up & plan our new classes. Please say a prayer, closing goes as planned for Friday. Thank-you! Have a Fabulous Week & Create Something Wonderful!